Apps to Support the Teaching of Computing | From Student to Teacher. From September 2014, computing will be a part of the National Curriculum and will replace ICT. It is now considered to be an essential part of a child’s learning process because of the ever growing use of technology in everyday situations. It is important teaching is taught in a fun way that is accessible for children’s understanding, as computing can be a hard concept to understand. With technology being such an essential part of everyday society, more hardware such as iPads are being used widely in the classroom environment. Therefore, apps are made to aid the children’s understanding and development. There are a wide range of apps all suited to different ages and targeting different elements of computing. Recently, in our digital literacy sessions we have been looking at a range of apps that would help children to understand computer coding. This enabled us to see how wide a variety of apps there are, all based around different things, aiding different key stages. After looking at these 8 apps in greater detail, I now think that I have the knowledge to be able to assess and evaluate the apps and how they would benefit children within the classroom. 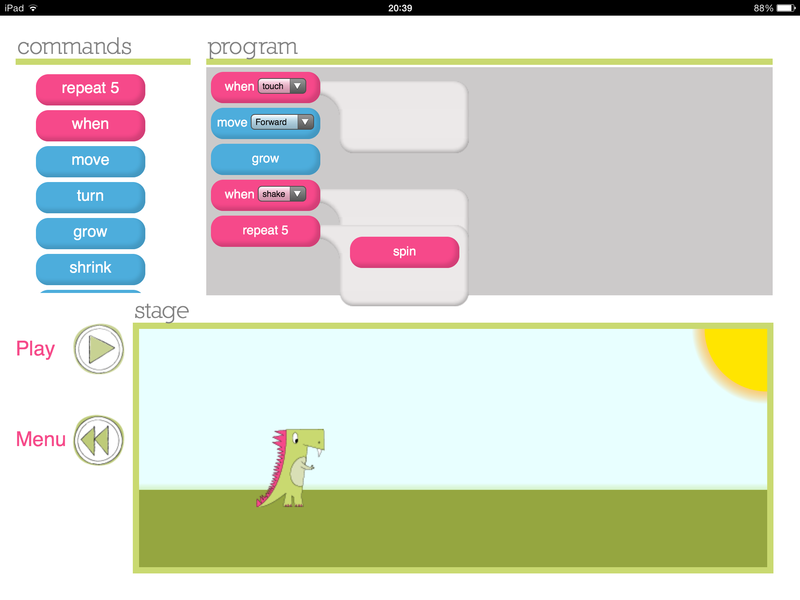 Daisy the Dino is a basic computing program aimed at KS1, this enables children to use 2 modes, either play or challenge mode. Play enables them to use all the tools from the beginning, the command menu is along the left hand side and these are then dragged across to be the program. This then moves the dinosaur along the bottom. The challenge mode, teaches children the very basic steps to just getting the dinosaur to move,onto more complicated things. This app would be great for introducing the concept of computing, but would not be appropriate for children who already have prior knowledge of computing. The app gives children an understanding of sequencing and looping events. The advantages of this app are that it is very simple and gives children a tutorial as well as the chance to get stuck in straight away. It looks very appealing and colourful which will therefore catch young children’s attention. 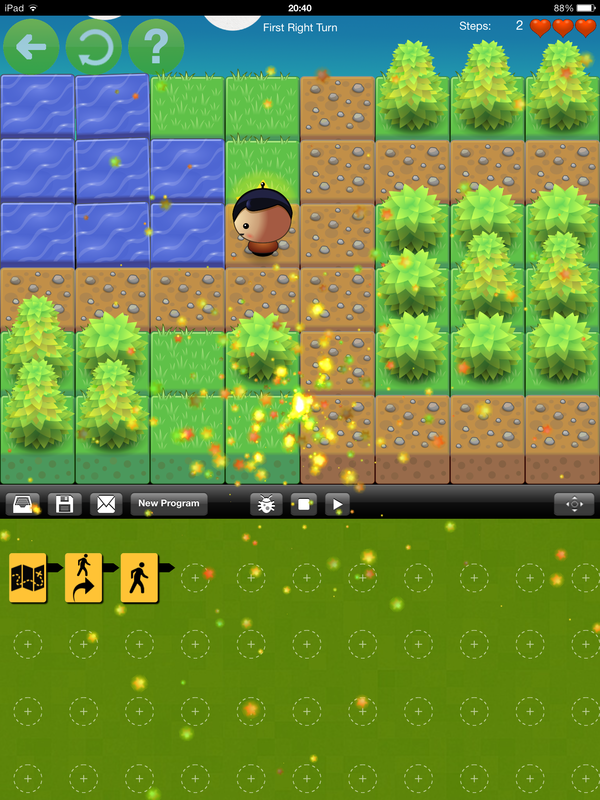 It also encourages children to download a kit to help program their own games once completing this app. The disadvantages of the app are that it is very simple so once the children have an idea of how to program the dinosaur there isn’t a great deal of development work the children can do afterwards. Also, there is a limited amount of things that the dinosaur can actually do, if it was able to do more things then it may engage children for a longer period of time. 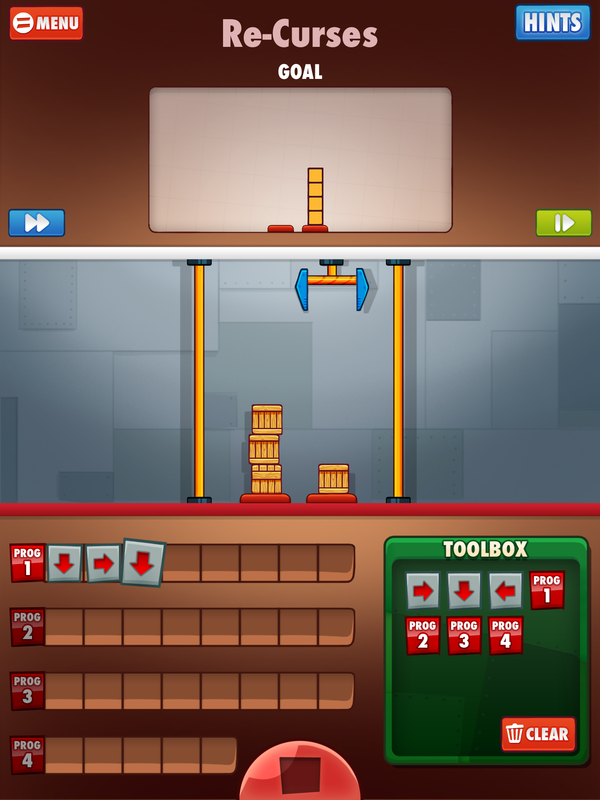 Cargo Bot has the objective of getting the user to move the crates from one position to another, this is a great puzzle for children that requires logical thinking as well as a fun introduction to programming for children, because of the level of logical thinking this game requires, it would ideally be aimed at children in KS2. The main advantage of this app is that the layout is excellent and the introductions are simple, enough for children of all ages to be able to understand, which makes the app accessible to a wide variety of people. The app also encourages children to use logical thinking patterns and as they progress in the app, it gradually gets more complex. The main disadvantage of this application, is similarly to some of the other applications that I have looked at, like Bee Bot, there are only arrows used instead of technical vocabulary and as the app, in my opinion, is aimed at KS2 then key terms should be used in order for the children to become familiar with the vocabulary. This app would be great for children of all ages, however, the levels get significantly harder so it may be something that KS1 children will struggle with, as it is about memorising just as much as programming, although, given the right instructions the children could be encouraged to use their fingers to follow where they are on the screen which may help with the complexity of the game. 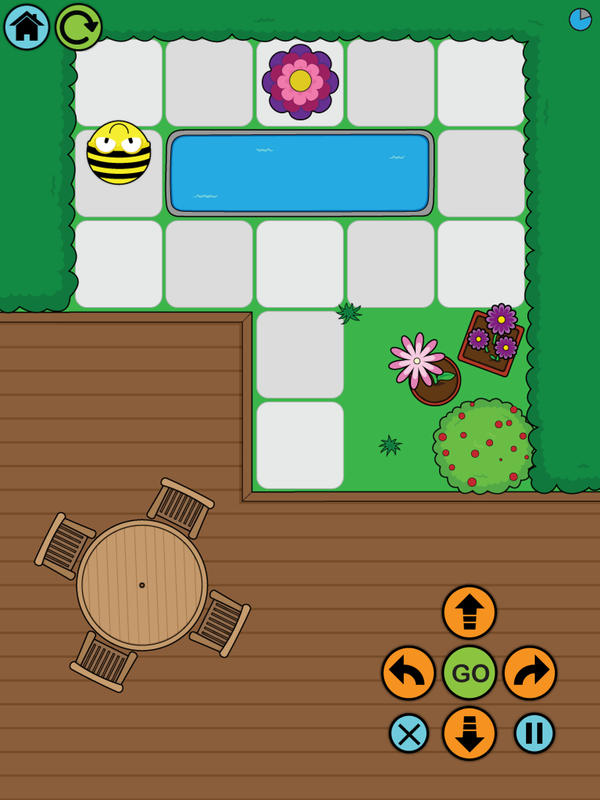 The advantages of this game is that it is bright and colourful which would automatically attract the children’s attention, it is also easy to navigate and is straight forward to use, as all the buttons are clearly labeled and once completing it you just click the ‘go’ button to ensure that the bee has made it’s destination. The app is also cross curricular as it can bring in elements of maths when teaching children about direction and acts as an opportunity to bring in key mathematical terms such as 90 degrees. The disadvantages for me are that because the game solely relys on children understanding their lefts and rights there are some issues around SEN as children who have dyslexia often get confused, therefore making this game inaccessible to them. The app also only has 12 levels, so depending on how quickly children grasp the concept of the app could depend how quickly they get bored of it. Additionally, no coding language is used, only arrows which when using with younger children to introduce the concept of coding is fine, but when progressing the children on it is important that key terms are used. 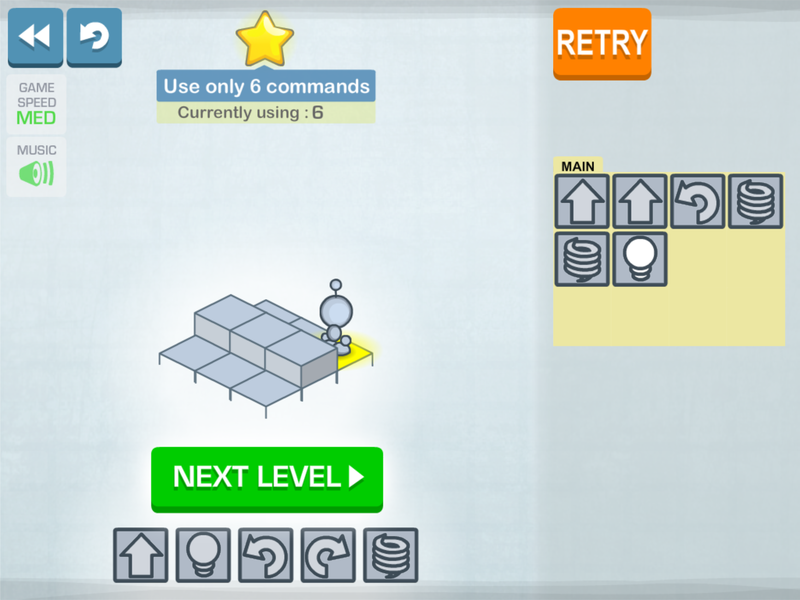 Light Bot Lite is a programming puzzle that can typically be used with older KS1 children and younger KS2, this helps the children to understand programming concepts as well as having fun. The app has many different levels to it which enable children to develop and extend their knowledge when going through and can also help the teacher to identify who is struggling. The advantages of this app are that it has simple instructions that can be understood by children and the levels gradually increase complexity, once introducing the overall concept of programming. The app is also fairly easy to navigate. Similarly to Bee Bot, the app may have some SEN issues as again it uses the arrows to represent left and right which can confuse children with dyslexia. Another disadvantage is that the game isn’t brightly coloured so therefore it wouldn’t be appealing to children. Kodable is a great app for introducing children of a young age to computer coding and programming. This app would be particularly beneficial in KS1 as it allows the children to create their own characters using their gender and name, therefore it directly addresses the child. The app uses arrows to direct the character. The advantages to this app are that it encourages young children to have a logical approach to solving problems using sequencing and introduces the idea of loops. The app has many different levels, increasing in complexity, which enable the child to use prior knowledge to be able to reach the end objective. The main disadvantage for me is that no key terms are mentioned, just the use of arrows however if this app is used appropriately, for example just to introduce the theory of coding and then progress onto something that incorporates key terms the app would be very effective. Cato’s Hike: Available to download free from iTunes for the Lite version, or £2.99 for the full version. 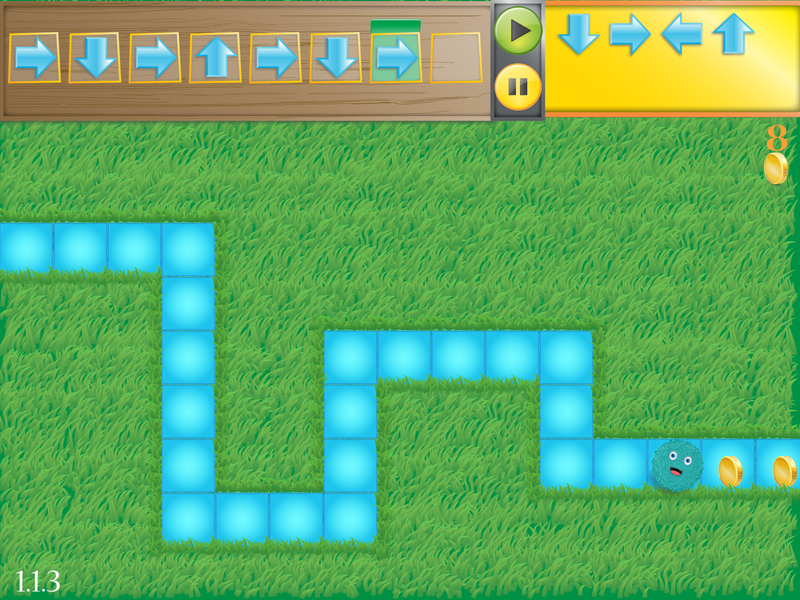 Cato’s Hike is used to teach children basic programming skills. It would be best suited to KS2 as the app is considerably more complex than some of the other apps I have looked at in detail, as there are many different symbols used and children could easily forget which each of them mean. The advantages of this app are that it is very eye catching and appealing for young children and the instructions are clear and bold. The app also includes a variety of different levels and clear tutorials which enable the app to be accessible to a range of ages and can act as a motivational technique to children as they want to reach a higher level than their peers. The disadvantages of this app are that although the instructions are fairly clear, there is a lot to read which may put the children off, and will often skip by, because they think they would be able to work it out for themselves. The app also uses symbols to direct the character around, which again doesn’t give children the key terms that will benefit them when extending their knowledge. Apps are used when teaching children computing for many different reasons. The first being that because the children can see them as being games, they become very addictive, this then makes the children more interested and engaged in their learning and also can get a sense of achievement from playing them. Another benefit of using apps is that if the child has a piece of technology that can access the app from home then it encourages them to take their learning beyond the classroom environment and gain a greater knowledge. However, with this in mind, the children still need to understand what the purpose is of using the applications and don’t purely think that it is just a game. This therefore means that the classroom teacher needs to use reinforcement to explain to the children what they are learning and the processes they are going through. When using an app it is important that at the end of the lesson the classroom teacher reflects upon the app and encourages children to think about what they have just done and have a recognition of why they are looking at it. As well, as doing all this it is important that key terms are also used in order to help develop the childs knowledge. E.g, Algorithms. Reblogged this on Miss Watt.